Now it was mid-week, and man, has it been a long one! Between working all day and detecting each night, plus the unexpected overtime, it was starting to catch up to me. I got back to the site after work and right away I noticed that there were unplugged holes and the ground was disturbed - and it wasn't by me. I also noticed a pile of relics off to the side. Anthony came out to greet me and was excited to tell me that he and his son were digging in the dirt and kicked up some relics and a few non-metallic items, including a really nice old glass perfume bottle stopper with the fleur de lis symbol on all 4 sides and a couple of handmade shale buttons. I think it's extremely cool how this hobby is contagious! 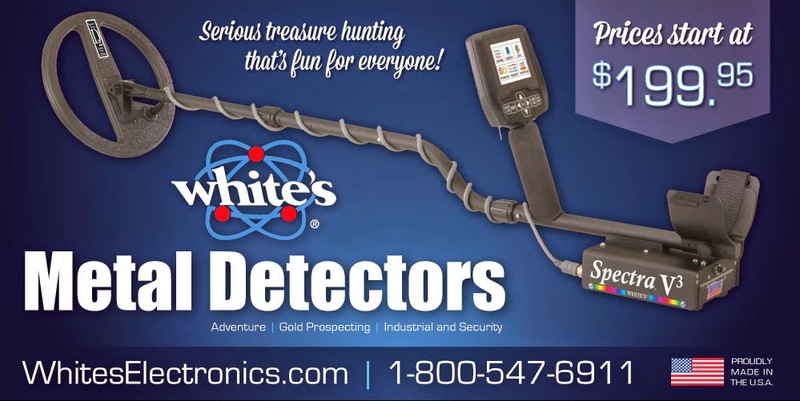 As we were discussing some of their finds, I branched off into another conversation with Anthony's father, Pete Schwickrath, and he mentioned HIS hobby, creating art out of aluminum foil. His work is incredible! I was amazed at what he was telling me he could do with tin foil and I could tell that he was both passionate and talented. Here I was joking around with the guy and it turns out he's an artist who's in the Ripley's Believe It or Not book! He explained how he started on a whim, creating a figure for his son and after seeing the joy that it brought to his son, he was inspired forever. Check out his website to see more of his work! It really is amazing. 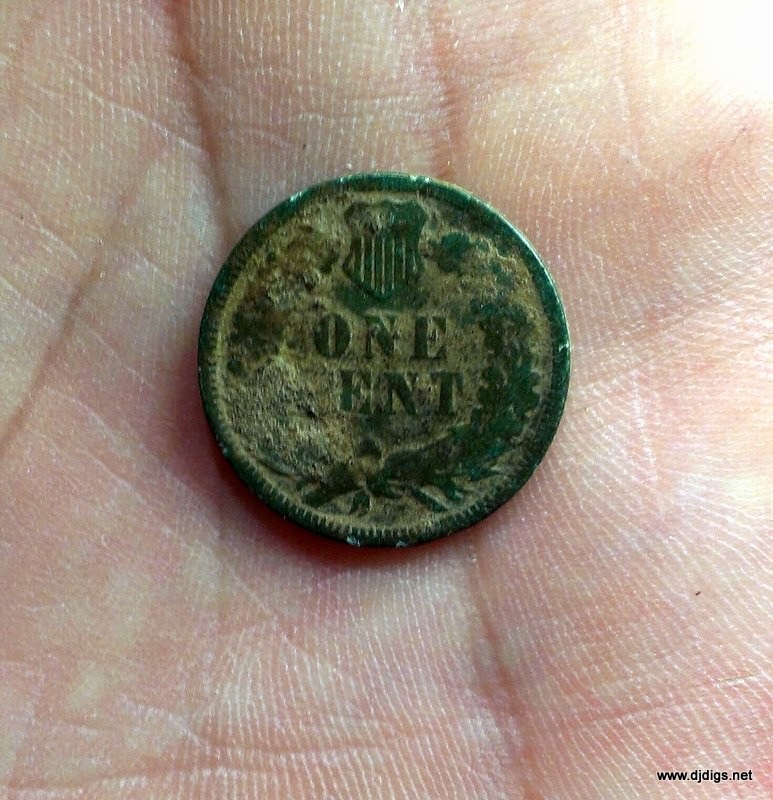 Now it was time to get to MY passion - digging. 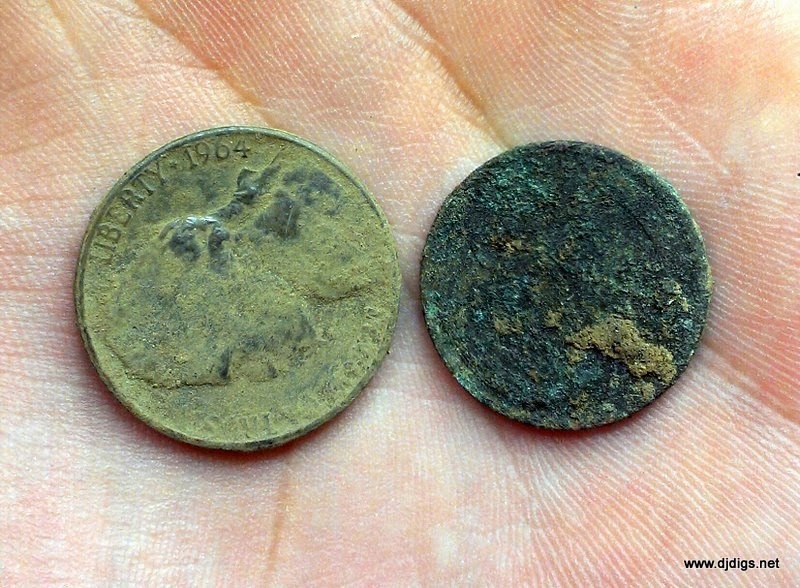 an unidentifiable wheat penny and a 1964 Jefferson nickel. 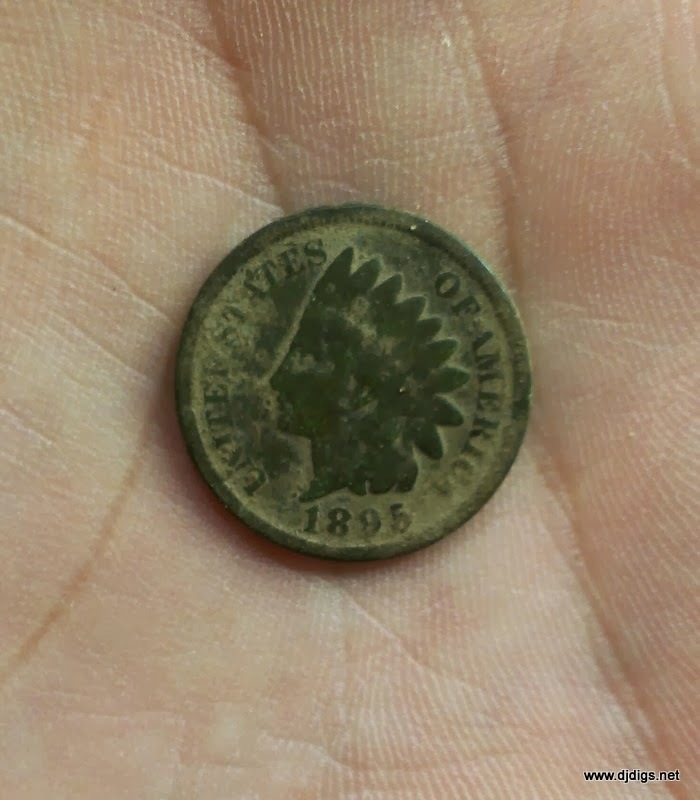 I also kicked up an 1895 Indian head penny before it got too dark. Just after sunset, I called it a night. I didn't think I'd make it back until the weekend. The following day was Halloween and not only was it pouring, I was practically dead on my feet. But, the rain ended, we got out of work early, and I couldn't resist - I went back to hit it again. 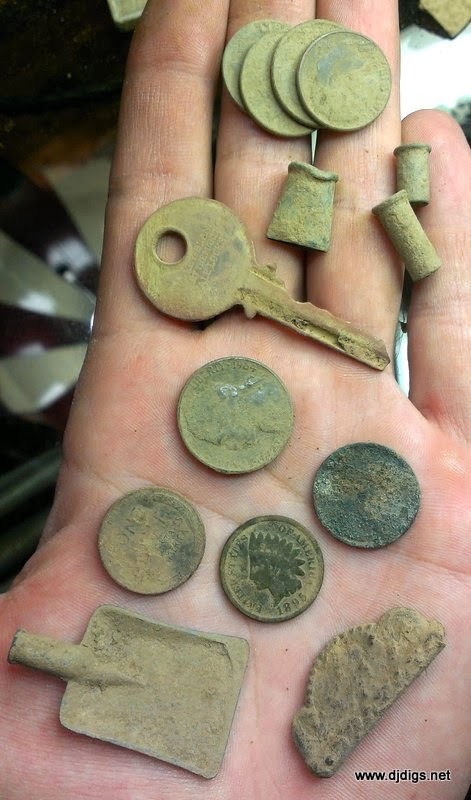 I spent about 45 minutes digging and I came up with another wheat penny, a suspender clip, a tiny shovel head, a key, and a few modern coins. I had to hurry in order to get home to hand out candy with our little ladybug. 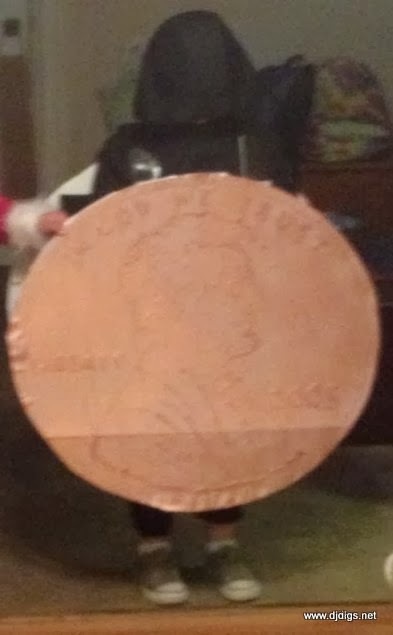 who was dressed as a PENNY!